Miniature chocolate chips are baked into these colorful shamrock-shaped cookies for a fun and tasty St. Patrick's Day treat. Combine flour and baking powder in small bowl. Beat butter, sugar and vanilla extract in large mixer bowl until creamy. Add eggs one at a time, beating well after each addition. Gradually beat in dry ingredients. Stir in morsels. Refrigerate for a few minutes until firm. 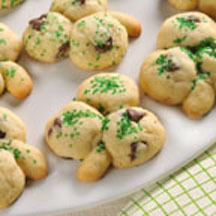 Shape dough into 3/4-inch balls; place three together to form shamrock shape on ungreased baking sheets. Roll small amount of dough to form stem. Sprinkle cookies with green sugar. Repeat with remaining dough. Bake for 8 to 10 minutes or until edges are lightly browned. Cool on baking sheets for 2 minutes; remove to wire racks to cool completely. Nutritional Information Per Serving (1/48 of recipe): Calories: 110 Calories from Fat: 50 Total Fat: 6 g Saturated Fat: 3.5 g Cholesterol: 20 mg Sodium: 40 mg Carbohydrates: 13 g Dietary Fiber: 0 g Sugars: 7 g Protein: 1.